Wow! 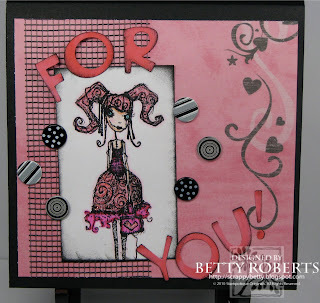 What a great way to greet the Stampotique Designer's Challenge into your daily stamping routine. We had such an overwhelming turnout for our first challenge, and we want to thank you all who joined us. We are so excited by the response we received and loved seeing everyone's creations with the "LOVE" theme. 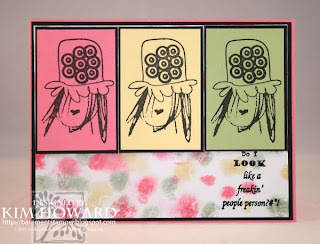 We also have another blog set where the Design Team will be displaying their work using Stampotique Stamps all the time. You can find the new blog here. The random winner of our first $15.00 gift certificate is Margie. You can check out her fabby creation here! 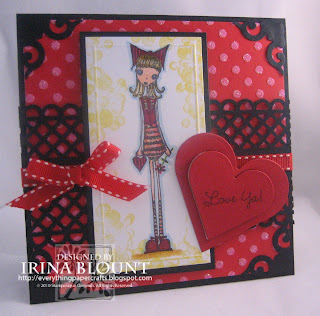 This week I'm excited to be the hostess of our 2nd Stampotique Designer's Challenge. 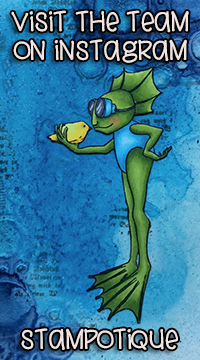 This week you are required to use Stampotique stamps to participate and one participant will be randomly selected for a $15.00 Gift Certificate to Shop at Stampotique! If you are uploading to SCS or another site, please use SDC2 as your keyword. Please upload your direct link to your card on Mr. Linky below. Links that do not directly link to your challenge card may be deleted. Please leave your link by Tuesday, March 2, 2010 at 9 p.m. EST. The hostess will pick her favorites a few days before the challenge ends & a random winner from all the challenge entries will be announced in the new challenge post. You can click on the designer's project to take you directly to their blog if you wish to leave them some love on their blog, we love to hear from you all! We sure hope that you enjoyed our first challenge! We have another coming up this week, so don't miss it! Thank you all for playing and we'll announce the winner with the next post! The Design Team were very impressed with your creations and we've decided to highlight a few each week. We're in the process of making a button for your blog, should your card be featured here! The Hostess of the Challenge will choose her three favourite cards and they will be posted here in the challenge forum a few days before the next challenge goes up! It wasn't an easy task, as there were so many sweet entries, but here are my picks ! 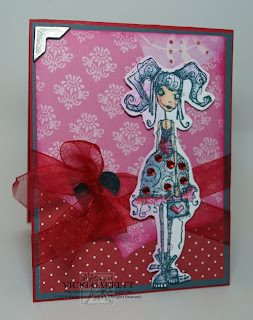 I am SO excited to be the first Hostess in the Stampotique Designers Challenge!!! 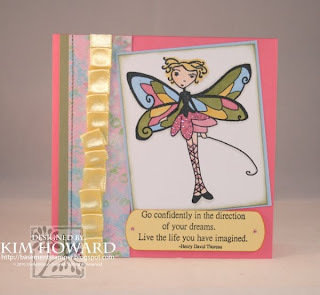 The designers, along with Carol have been working diligently behind the scenes to bring you this fun forum where you will see a lot of great ideas for Stampotique images as well as the chance to Challenge yourself and to try some new techniques, themes and sketches! In addition you can win some Stampotique Swag just for playing along! 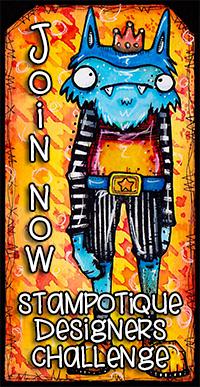 A BIG thanks to Kim Howard for designing our blog, banner and blinkie! Please feel free to add it to your sidebar! We'd love to have your support and of course want you to play along! Just a little about the Blog! Each of the very talented design team will take turns hosting challenges, which will be held twice a month! You have the chance to play along as long as you link your creation by the Tuesday evening at 6 p.m. est prior to the next challenge. The first challenge of the month will allow you to use any stamps or images, the second challenge, will be Stampotique exclusive. A winner will be chosen randomly from all of the entries and will be announced at the next challenge. Now for our first challenge!!!! We'd love to see you create a Love themed card! I know that Valentine's have passed, but it is with much love for Carol, Jim and Stampotique that we bring you this blog! If you are uploading to SCS or another site, please use SDC1 as your keyword. 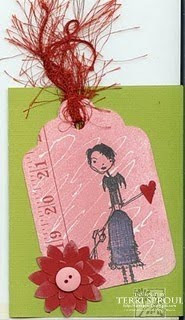 One participant will be randomly selected for a $15.00 Gift Certificate to Shop at Stampotique! I'm trying to upload Mr. Linky! If you see it, please add in, but if you don't please post a link in the comments sections, so that we can see your fabby creations! And now, without further adieu, I present to you the Stampotique Design Team creations !!!! 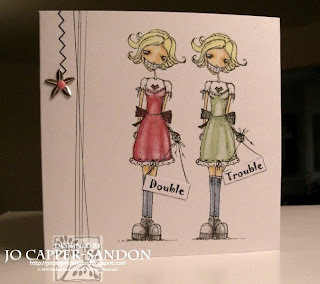 The Stampotique Design Team are very excited to bring you this Challenge Blog! Whether you've been a long time fan of Stampotique or are new to their images, you are going to love what we have in store for you! Our First Official Challenge will post this Wednesday! 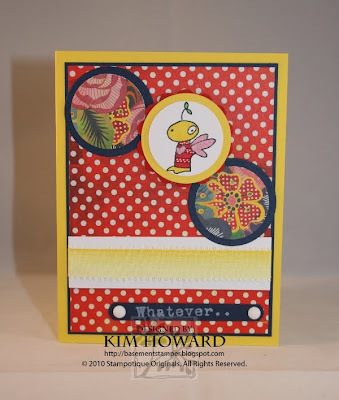 With our first post, you'll find out more details about the challenges, how things will work , see some great creations using Stampotique Originals images and hopefully play along with us! Here's the what's what on the Fabulous design team! Hi Everyone! My name is Kim Howard (or BasementStamper) I got hooked on stamping while traveling for work and staying with a friend who broke out her stamps & paper for me to play with one night while she was at work. 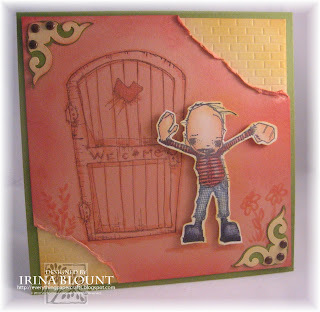 Oh, did I have a blast and my love for stamping has only grown. I find being creative in my deep, dark basement provides me with a little escape from the day to day activities allows me to be a happier person. I have mostly created cards, but this year am making an effort to branch out and go "out of the box" on my creations and the techniques I use. 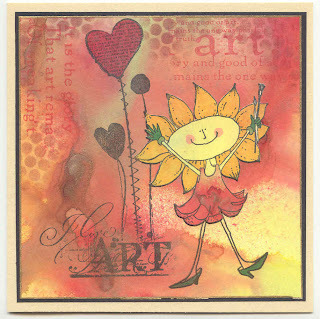 I hope you all enjoy the fun challenges & the awesome Stampotique Originals Stamps! Hey there! 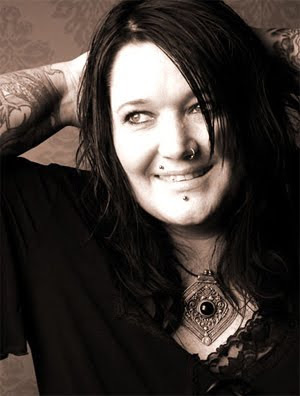 I'm Vicki Garrett.......aka Vicki G or Summerthyme64 over on SCS! My love for stamping all started when a coworker brought some stamps in to work for us to play with over lunch! Can you say FUN! I was totally hooked from that point on. 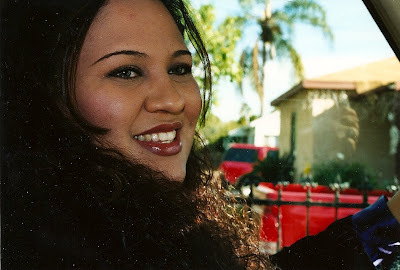 That was about 6 or seven years ago! I discovered Stampotique and Carol and Jim at the first CHA winter show I attended in 2008. I completely fell in LOVE with their stamp line and sashayed into their booth, refusing to leave until they promised to let me do some design work for them! In all seriousness, I feel very happy to be able to work with Stampotique images as I love to colour and they have such a good variety to choose from. 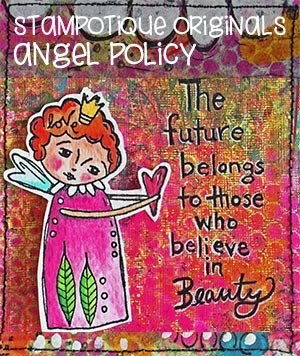 I am blessed to be part of this group of talented women and truly hope the challenge and creations that we share bring you motivation, inspiration and pump up that stampin' mojo! I live in Halifax, N.S., Canada with my husband, who is also my best friend. I have 2 adult sons, working in Fort McMurray, Alberta. I keep busy working at a large grocery store in the Post Office, and I am taking a Medical Transcription course as well. I also teach stamping classes at a few local stamping stores. I started stamping 22 years ago when I was pregnant with my first son. I wanted to make some special baby announcements. Little did I know that I would love stamping so much. 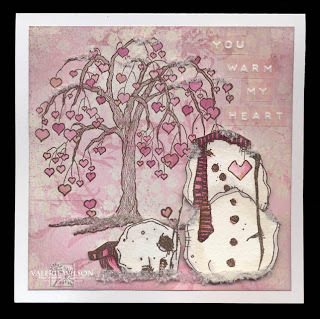 So, if I am not working, studying or spending time with my husband, you will usually find me creating in my stamping room! 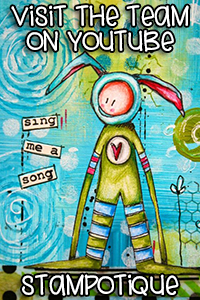 I have been published in CorrespondanceART, Simply Sentiments and Paper Creations. 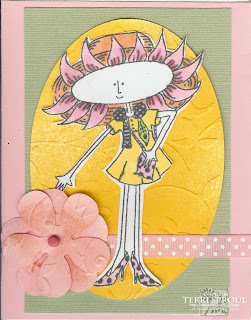 I am just thrilled to be part of the Stampotique Design team! I'm 45 and live on the south coast of the UK in a tranquil village with my husband and two sons, 7 and 18 and a little flock of chickens. I trained originally as a printed/woven textile designer and so love texture, colour and layering and generally tend to work with mixed media and recycled bits and pieces. I've been stamping for six years and belong to various Design Teams in Europe and the USA. I also write regularly for Craft Stamper, a UK stamping magazine, appeared as guest artist in Stamper's Sampler and have recently been commissioned to write my first book which is currently underway. 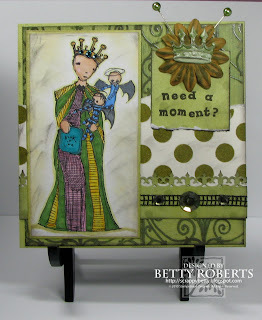 So its stamping, crafting and more stamping when ever I get a spare moment. 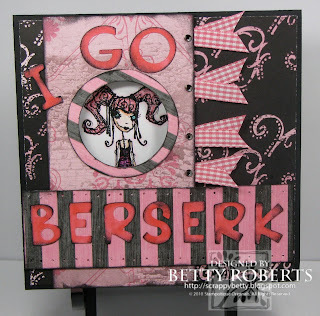 Hello my name is Betty Roberts I have been paper crafting since I was in junior high... I think I invented it... just kidding. I just remember having to make my own "embellishments" or decorations as I called it for my scrapbooks. Of course back then, the scrapbooks were pictures and newspaper clippings! I bought my first rubber stamp after high school one day while perusing the mall. I thought to myself and remember telling my mom, "I will never have a collection of these, they are so expensive!" Well that was about 5000 stamps ago! 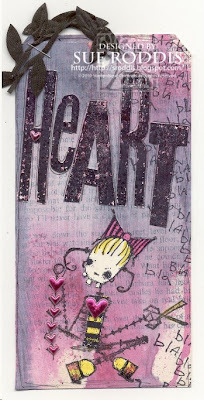 I love off beat Tim Burton-esque stamps and believe it to by my style, but love challenging myself to try new stuff. I am constantly crafting and creating. From scrapbooking to rubber stamping and sewing to baking unique cakes and party plannng. 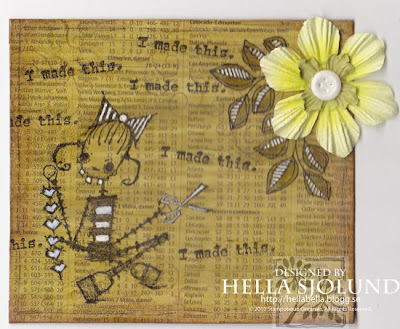 I someday hope to make my mark in the craft world with my own stamp and scarpbook lines! I am excited to have been asked to join Stampotique as it is right up my alley in the way of style and uniqueness! Happy stamping all! 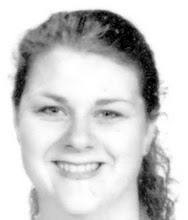 I´m a 37 year old woman & I live in Sweden with my lovely wife & two wonderful teenagers. My biggest hobby is stamping/scrapbooking, and I bought my first stamps in 1995. In my collection there are over 2000 stamps at the moment and the collection just keeps on growing. I looove to stamp! 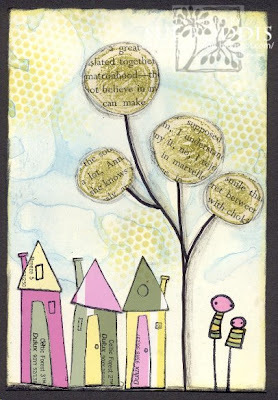 In my art I love to use many little decorations combined with a couple of stamps & some papers. My favorite style is vintage & gothic. I find stuff to scrap with everywhere. Tell me, am I addicted? My other favorite things include to photography, going to music festivals and concerts, writing poems, watching a good movie or snuggling with my wife. 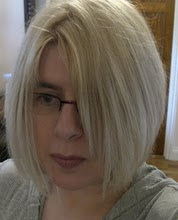 You can see my art at: http://fruarnalilja.se & you can read about me on my personal blog: http://mlilja.net. There is a translation-tool on both of them. 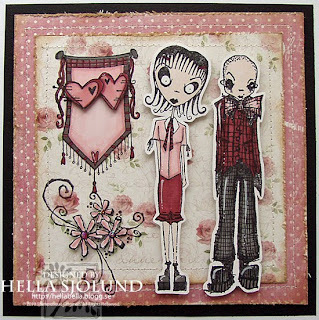 My name is Hella Sjolund, a Swedish cardmaker (and scrapbooker) with a whole life of creations behind me. 6 years ago I found rubberstamps and now I´m a true addict! 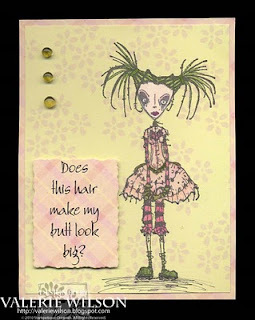 I love Stampotique's Gothic characters as they go very well with my grunge style of cards. My other creations are very pink and cute, so you will be seeing both sides of me here. I´m really looking forward to this challenge and I´m hoping to be a inspiration for you! Valerie, who has been crafting since she was old enough to hold scissors, can always be found flitting between projects within a diverse array of hobbies. Being an amerature photographer with a love of nature, it only makes sense that Valerie is also an avid gardener constantly trying to attract wildlife ever-closer to her lens. But once the sun sets, the birds are roosting, and the moths are fluttering about the front porch, Valerie always comes back to her first obsession – paper. 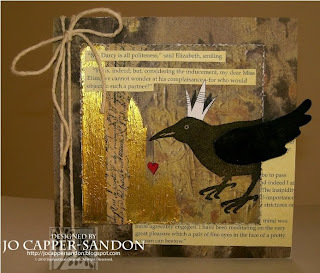 It is common to find Valerie burning the midnight oil in her craft room - making cards, rubber stamping, creating jewelery, binding books, reading blogs or preparing to teach some crafty activity to anyone who will listen. 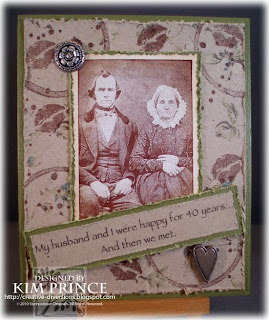 Valerie has been published in Correspondence Art, Simply Sentiments, Jewellery Creations by Paper Crafts and Holiday Cards by Paper Crafts. 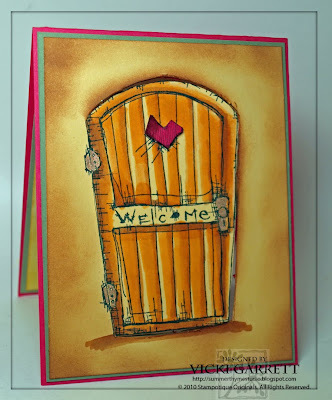 She invites you to visit her new blog at http://valeriewilson.blogspot.com which includes a sidebar link to her entire gallery of cards, projects, templates, Silhouette GSD cutting files, published work and more at http://steadywinds.com/valgal. 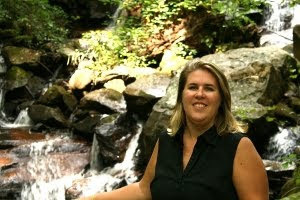 Valerie is looking forward to sharing her new projects featuring the irresistible images of Stampotique Originals!! 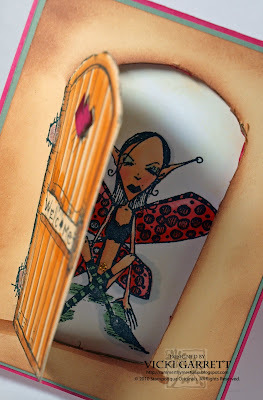 “I have been stamping for well over ten years and over that time my own style has changed and grown and I now find that I prefer to make "things" rather than cards and that I like a collage/altered/outside the box approach to things! My work has been published in many UK mags over the years and more recently in the USA in several Stampington publications including Somerset Studio, several Tweety Jill books, Altered Arts magazine, Paper Creations magazine and in Holland in Art Specially magazine. Until very recently I taught workshops here in the UK but in the next couple of months I have a big change in my life........I am moving to Kazakhstan where my husband has a new job!